Washing safely and effectively is something all detailers continuously strive to master and part of that equation is having the right washing tools. The DI Brushes Boar's Hair Car Wash Brush is extremely gentle and completely safe for washing the vehicle's entire exterior. The boar's hair fibers are known to be the softest 100% all natural fibers ever put in a washing brush. It's much safer than synthetic mitts and sponges and this brush is extremely durable. For the best results put the brush in your wash bucket for about two minutes so the fibers can get completely soaked in your wash solution, then begin washing top down as you normally would. The extremely soft fibers glide over the paint and break up contaminants gently. When you put the boar's hair brush in your rinse bucket it releases contaminants with ease where as other mitts and sponges trap the contaminants that leads to swirls. Therefore this brush will stay a safe and effective washing tool throughout your washing process and for years to come. 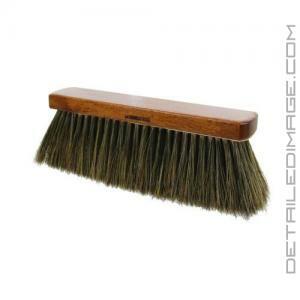 This entire brush represents the highest quality manufacturing which allows you to get top quality detailing results. So for those who want to wash quickly, effectively but most of all safely the DI Brushes Boar's Hair Car Wash Brush is perfect for you. Had one of these before and it got stolen from my truck. I've been missing it for a year. So when they were discounted and the best price I could find I got it from Detailed Image. Works the same as the one I had for the last 10 years. No evidence of scratching. I rinse the brush between panels and use high quality soaps. Anything can swirl, aka scratch paint. This brush is the safest brush you can buy. Rinse the vehicle thoroughly before introducing soapy water and any wash element. Use a good soap too. Lubrication and light pressure equal success! Beautiful quality, works as advertised. If you enjoy car care, you need this, the best price always, I would always check Detailed Image first!! !